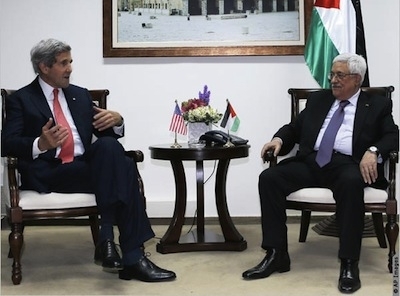 The April 29th deadline has not yet been reached, but it may be said with confidence that the initiative by Secretary of State John Kerry to revive the 'peace process' between Israelis and Palestinians has already reached its final destination: failure. The failure of this initiative was obvious from the beginning. To everyone except, apparently, Kerry himself. This reality lent an element of low farce to the entire proceedings. By now, it should really be obvious to any serious observer that there is no chance that the Israeli-Palestinian negotiating process will produce a comprehensive peace between the two sides. There are two core reasons for this. One of them is of long-standing, the other is a development of the last decade. The first reason is because the Fatah movement, headed by Palestinian Authority Chairman Mahmoud Abbas, is simply not interested in exchanging its historic goal of reversing the verdict of 1948 for the establishment of a small Palestinian state in the West Bank. This is the reason why it has refused every concrete proposal to end the conflict along these lines – from the Clinton proposals of 2000, via then Prime Minister Ehud Olmert's plan in 2008, to the recent refusal by Abbas to declare that any agreement reached would mark an end to the conflict and to further Palestinian claims. The volume of proof supporting this contention is now so enormous that it is truly astonishing that this point needs to be made. But illusions die hard, apparently. So once more with feeling. The Fatah movement considers the acceptance of any sovereignty west of the Jordan river other than Arab Muslim sovereignty to be unimaginable. It will therefore never sign an agreement that includes the acceptance of such sovereignty. It will always find a reason not to do so, while for tactical reasons where necessary pretending that the problem is with the precise details of the agreement. As to why Fatah cleaves to this position. On the more superficial level, mainstream Palestinian nationalism considers that the 'imposition' of Jewish sovereignty over part of former British Mandate Palestine (not 'historic Palestine', an entity that never existed) constitutes a crime of such horror and magnitude that it can never be accepted. On a deeper level, this unusual refusal to compromise with reality derives from the movement's Islamic roots (the very name 'Fatah' derives from a Koranic term meaning 'Islamic conquest), which make it unimaginable that land once possessed by Muslims or Arabs can be accepted as having passed to another sovereignty. This process is experienced as particularly humiliating when the other sovereignty in question is that of a traditionally despised people, the Jews, rather than some mighty foreign empire. Thus far, so obvious. The second, newer development, however, deserves closer attention. The Israeli-Palestinian peace process also has no chance of success because there is no authoritative Palestinian Arab partner to the talks. Why not? The first and obvious reason for this is because there is no longer a single, authoritative Palestinian national leadership. Yasir Arafat, founder of Fatah, achieved little for his people and bequeathed them even less. One thing which he did both achieve and bequeath, however, was a single, united Palestinian national movement. This achievement did not long survive him. Arafat died in 2004. In 2007, the Palestinian movement split in two, with control of the Gaza Strip passing to Hamas, the Palestinian branch of the Muslim Brotherhood. Today, Hamas constitutes the more vigorous and formidable element in Palestinian nationalism. It presides over a small, sovereign Palestinian area. And of course, it opposes the negotiations and remains openly committed to the goal of destroying Israel. There is no prospect of Palestinian re-unification in the foreseeable future (though Fatah spokesmen are forever proclaiming that it is just around the corner). But there is a deeper and more historic aspect to this disunity. The division in Palestinian nationalism appears to be a return to the normal state of affairs, in which the Arab population of the area west and east of the Jordan River is divided into a variety of groups, with widely varying interests and agendas. Palestinian identity, it turns out, like the neighboring Syrian and Iraqi and Lebanese identities, turns out to be a far more flimsy and contingent thing than its partisans and spokesmen have claimed. The Israeli Arabs, though they continue to elect nationalist and Islamist representatives to the Knesset, react with horror to the prospect of exchanging their citizenship of the Jewish state for that of a putative Palestinian sovereignty. This renders absurd the claim of membership in a broader Palestinian identity made by the elected leaders of these Israeli citizens. There are today Palestinian Arab populations in three entities west of the Jordan River, each with their own interests, and own incompatible agendas. In addition to this, of course, there is also a large majority Palestinian population in Jordan, which today mainly accepts the continued rule of the Hashemite monarchy. So the very nature of the Palestinian political culture developed by Arafat and his colleagues precludes the conclusion of an agreement based on partition. But even if it did not, there is no single 'pen' with the authority to sign such an agreement on behalf of the Palestinians. Israel will and should continue to make clear to both the PA leadership and to Jordan that it is willing to reach a solution based on partition with appropriate security guarantees, or a long term interim accord if this proves impossible. Neither outcome looks imminent, however. Many Palestinians and the many western supporters of the Palestinian cause are convinced that the gradual international delegitimization of Israel is the key to final strategic victory over the Jewish state and the reversal of the verdict of 1948. This is an illusion. But it will need to work itself through, like the illusions that preceded it. When it has, sadly, it is likely to be replaced by a new illusion. Thus the reckoning with the reality of Jewish peoplehood and sovereignty will continue to be avoided, and the Palestinian politics of subsidized fantasy will continue.